interactive assessments that provide you with feedback based on your responses. Read more about how the unique AFIRM learning structure guides you through acquiring knowledge and practice applications. Do I want to earn a professional development certificate for completing a module? 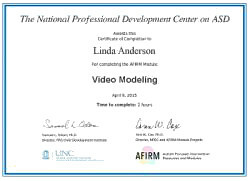 Each AFIRM module offers an option to earn a free professional development certificate. Use AFIRM certificates for professional development credits and licensure requirements. How do I earn continuing education credits? After completing the module requirements (i.e. Pre-assessment, Post-assessment, and Module Evaluation), access your My Account (top right corner of your computer screen) page for links to registering for continuing education credits. Note: You may need to review the module and take the post-assessment again if your post-assessment has expired in order to become eligible for CEUs or Type-2 CEs. Need more help or have questions? Visit the FAQs section.